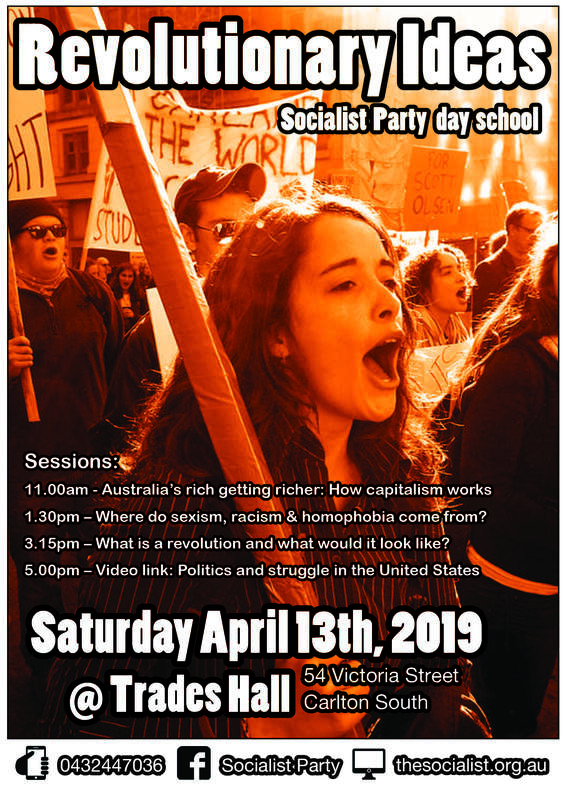 The Socialist Party’s ‘Revolutionary Ideas’ day school is happening once again, on Saturday April 13 in Melbourne. Held at Trades Hall in Carlton, the school will be an opportunity to debate and discuss the ideas needed to change the world. Kicking off at 11am, the first session, ‘Australia’s rich getting richer: How capitalism works’, will explain how the bosses have managed to accumulate such vast amounts of wealth. We will look at exactly how profits are made, and how workers are exploited. After lunch, at 1.30pm, there will be a session titled ‘Where do sexism, racism, homophobia come from?’ This discussion will look at the origins of oppression. It is only by really understanding the root cause of a problem that you can begin to deal with it. At 3.15pm we will discuss ‘What is a revolution and what would it look like?’ There are many misconceptions about what a revolution actually is. This session will set out to debunk some of the myths and look at how a revolution could unfold in a country like Australia. The final session of the day will feature a special guest speaker via video link from the US. The session ‘Politics and struggle in the United States’ at 5pm will look at how best to defeat Trump and what socialists say about Bernie Sanders’ run for president. We will also hear reports about some of the exciting labour movement struggle across America. The school will conclude with a fundraising social event. Dinner and drinks will be available by donation, with all money raised going towards the Socialist Party’s Renters Fightback campaign. All of the school’s sessions will be held on level 4 of the back building at Trades Hall, 54 Victoria Street Carlton South. A gold coin donation is requested for each session. The venue is wheelchair accessible and childcare is available by prior request. For more information text 0432 447 036 or contact our national office.